Relationships are like recipes. When one doesn’t work, you have to do something differently next time. 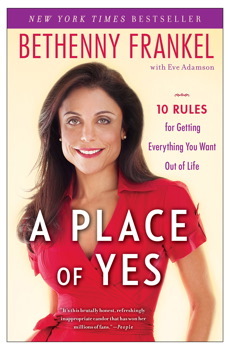 Learn how your relationships–good and bad–are all learning opportunities, from Bethenny Frankel, author of A Place of Yes: 10 Rules for Getting Everything You Want Out of Life. Our relationships are mirrors — who we choose, who we let choose us, how people treat us, how we allow ourselves to be treated, how we stay, how we leave, how we handle the hard patches and the good times — it’s all a microcosm of our own personalities. Every relationship you’ve had says something about who you are and what you want, even if (especially if!) the relationship didn’t work. Often, when a relationship fails, it’s even more defining and instructive. Each relationship gets you to a new place and can help you see what you don’t want as well as what you really do want. Relationships can also reveal patterns and recurring themes in your life. You might always choose partners who are like you, because you are trying to figure yourself out, or you might choose partners who are completely unlike you, because you are looking for something. Maybe you choose people who are caretakers or abusers, or exactly like your father, or exactly the opposite of your father. Maybe you go for handsome or rich without paying attention to kind or supportive. Maybe the timing is wrong every time. Your relationships aren’t coincidences. They are telling opportunities for learning more about yourself. If you’ve been with at least three abusive or cold or codependent people, it’s not because they found you. It’s because you sought them out, whether you want to believe it or not. Believe it. This is where the growth begins. Finding your truth by thoughtfully examining your past relationships is the only way to use your truth for better future relationships. What happened, and how does that clarify matters for you? What do you want? What are your deal breakers? Only you can answer these questions. You have your own journey and priorities that will teach you your truth. Maybe you are religious and you’ve had relationships fall apart because your partner didn’t share those values, and you need to realize that this is important to you. Maybe your family always had money issues, and finding someone who can provide financial security really matters and makes you feel safe and loved. Maybe you recreate an abusive past through your choice of partners, and you need to recognize that so you can go in a different direction. Maybe you seek something from someone else that you really need to find inside yourself, so you can be whole on your own. Relationships are like recipes. When a recipe doesn’t work, you have to do something differently the next time. Change the ingredients and you change the result. You take it or leave it — keep what worked in each relationship as you choose the next one, but learn to leave behind the dysfunctional parts. It takes some self-analysis, but you can do that. Anyone can. And if your relationship does work, learn to leave it alone. Don’t overthink what’s good. Are you creating problems where none existed before? That says something about you, too. My past relationships have consisted of what I sometimes think of as ill-conceived recipes. Each was missing something, or had too much of something else. My relationship now works, like a recipe that never fails, so my task now is to stop messing with it. Whatever your story, take a magnifying glass to it and look to see if there’s a flaw in your approach to relationships — how you started, how you communicated, where you’ve been, where you are now, and what it all means to you. What you find there can tell you everything you need to know about what you should do next — what you should take, what you should leave, who you want to be with, and even who you want to be. BETHENNY FRANKEL’S no-nonsense, tell-it-like-it-is personality won over countless fans, and made her a nationally bestselling author and the star of her own hit Bravo show Bethenny Ever After. Now Bethenny opens up and shares the obstacles she overcame and the great success she has enjoyed while discovering how to approach life from “A Place of Yes.” Bethenny’s path was not always clear as she overcame a difficult childhood, failed relationships, entrepreneurial efforts that never quite got off the ground, and lifelong money struggles. To deal with these challenges, Bethenny developed ten rules for pursuing her goals with authenticity and drive.